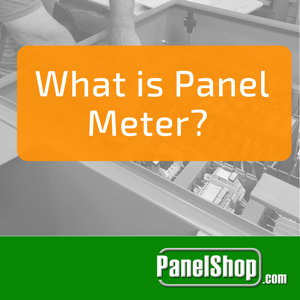 What is a Panel Meter? Panel Meters are an essential component of any industry where monitoring and/or control of equipment is taking place. These are instruments that display a signal’s analog or digital value, depending on the product’s specifications. Modern panel meters have advanced capabilities such as alarms, transferring data via different mediums, etc. The basic principle of operation is as follows: a sample of voltage or current is taking from the signal and visual representation is created. Voltage measurements are usually taken across the load while current measurements are in series configuration. Supplementary devices are also used for high-magnitude measurements such as current/voltage transformer in high-power systems. 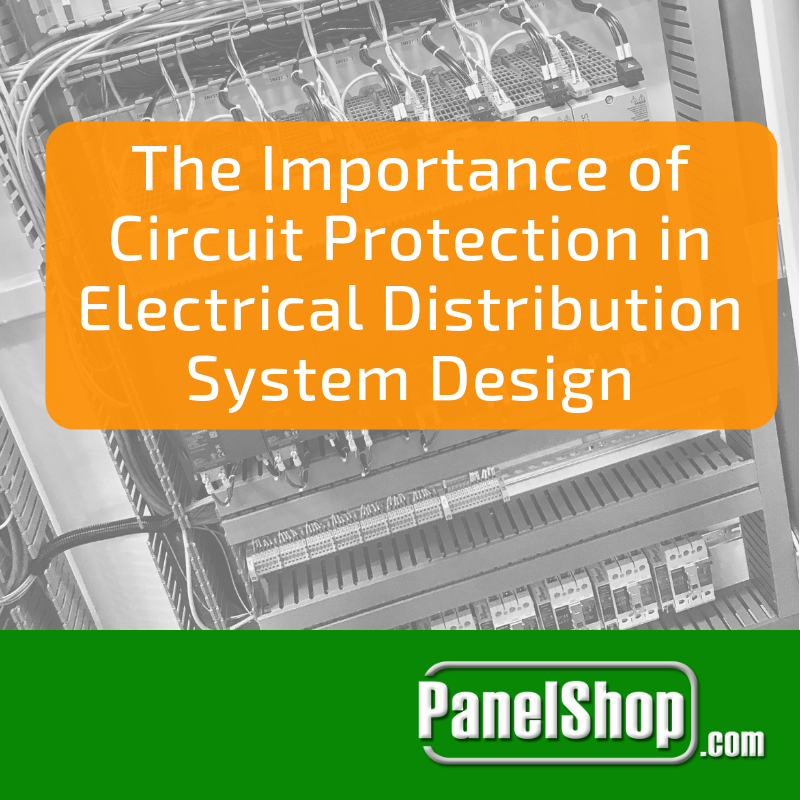 A common application of a panel meter is motor current monitoring. A motor that runs fans or pumps in an industrial setting will have certain line parameters. For instance, the resistance of the fan may increase due to filter blockage, which if not treated, can lead to a cascade of problems, most notably halt in operations. Alternatively, a broken belt can lead to a drop-in motor output current, which must be dealt with immediately to regain productivity. A potential or current transformer can be used to measure the voltage and currents respectively, which can then be displayed on a panel meter. 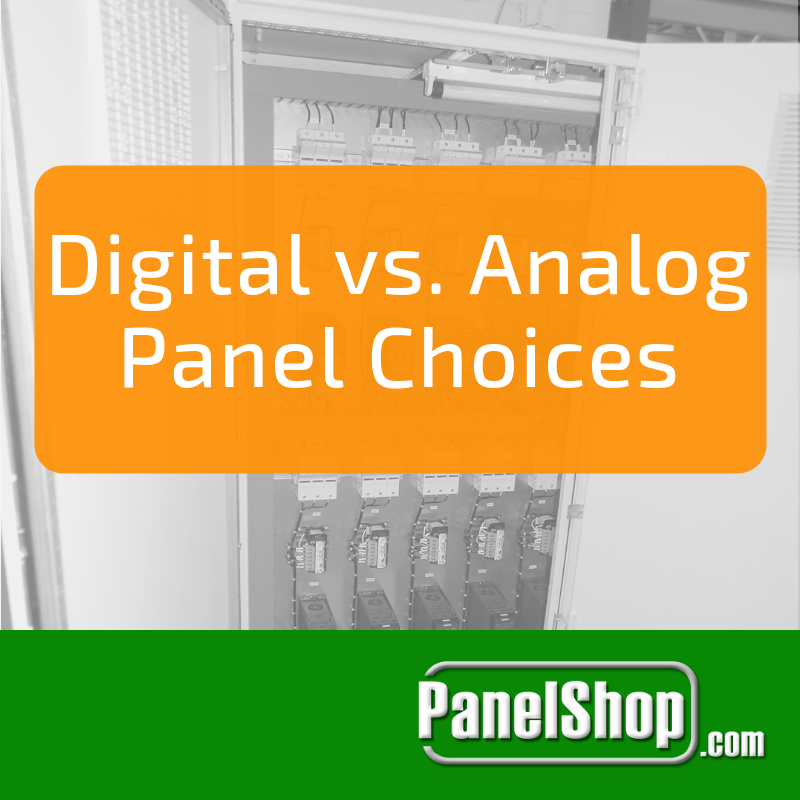 There are two major types of Panel Meters: digital and analog. Digital panel meters typically read an input signal, displaying it within a panel, examples being that of voltage, current and resistance. The signal comes from a sensor, whose input is converted into digital form and then displayed as a variable, e.g. temperature, pressure, etc. Depending on the functionalities, the meters can also act as controllers, generating a control signal that drives an actuator, relay, safety gate, etc. Analog: the panel meter provides an analog output, i.e. variable current or voltage, proportional to the input signal, which can then be amplified to control output devices. Data interface: this allows the user to transfer the panel’s measurement to another device such as a PLC or a Computer. Set point: the value, which if crossed, would result in activation of an alarm. Numeric: this means that the panel displays only numbers; most products have this type of construction as the values that need to be displayed are mostly numbers. Alpha-numeric: both numbers and letters can be displayed on the screen, which is suitable for complex signals. Either LCD or LED is used as the display of a panel meter. An LED display consist of diodes that light up, usually following a N-segment algorithm. The benefit of an LED display is its visibility in the dark. On the other hand, an LCD displays black digits over a gray/green screen. LCDs are less power consuming compared to LEDs but require a backlight for visibility in the dark. The device’s physical compatibility with the panel is determined by the size of its panel face. Typically rated in millimeters or inches, the size is specified by both length and width, sometimes even depth. The display to be selected should have dimensions that can fit inside the control panel. Furthermore, the display should be large enough for operators to see, depending on the distance they would be standing at. These are devices that measure analog signals and display them directly without any intermediate conversion. The values are displayed on a dial, usually with a scale, pointer and needle. Generally, an analog panel meter accepts a signal input, but based on the model can also accept multiple signals, such as pulsating frequencies. These are known as multiple channel analog panel meters. The introduction of digital panel meters has pushed out analog products, however, they are still used in some applications. Modern analog meters usually feature anti-glare and illuminated face displays. Taut band: A moving pointer is suspended between two ribbons of metal that reduces friction and improves sensitivity. 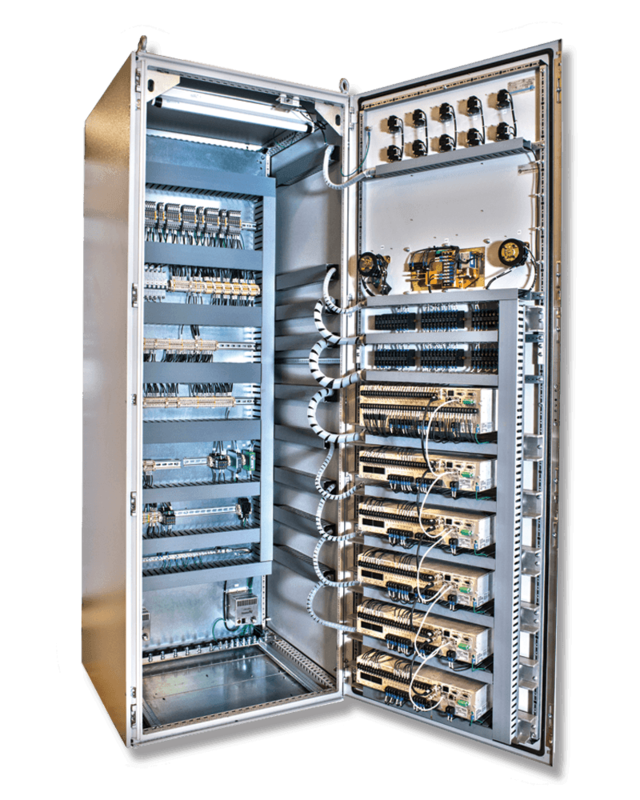 These devices can withstand randomly generated shocks, making them suitable for rugged environments. Pivot & jewels: These can withstand shocks but are not as accurate as taut band panel meters. The operation method involves a coil & pointer being suspended by steel, fitted into two jewel bearings. The most common use of Pivot & Jewel type is measuring alternating current while Taut band type is employed for direct current measurement. Furthermore, analog panel meters are available in more than one channels, having the capability to measure multiple variables in different units. They are commonly used to measure three phase power. Devices are also available that can measure radio frequency signals. Most analog panel meters usually have a range of measurements that fall between 0 – 4 mA or 0 – 10 VDC. Face type, depth behind panel and dimensions are common specifications for an analog panel meter. The most common face types used are either round or rectangular. Round devices vary by front face diameter while rectangular devices vary in terms of front face height. For devices that have zero as a reference point, scaling methods that are commonly used are zero-right, zero-left and zero-center. Totalizers: these panel meters take the sum of an input signal over a specified period of time. Totalizers are generally used to count pulse inputs or in flow measurement applications. Temperature and process panel meters: this is the most common type of panel meter, and accepts a single channel input, displaying it digitally on the screen. Common inputs are those taken from temperature sensors such as RTDs and thermocouples. Multi-input indicators: a type of digital panel meters, it can accept more than one input. Most meters have a switching button that displays the output of the subsequent channel, while there are others that can scan all channels automatically, switching its output periodically.